Modified (slightly cropped) depictions of Eckhout's series of eight figures (c. 1641). Top row (L-R): "Tapuya Man," "African Man," "Tupi Man," "Mulatto Man." Bottom row (L-R): "Tapuya Woman," "African Woman," "Tupi Woman," "Mameluke Woman." Oil on canvas. Each painting is approximately 8'9" x 5'4" (about 274 x 167 cm). Click on collage to see paintings in greater detail. We don’t know where these paintings were originally located. 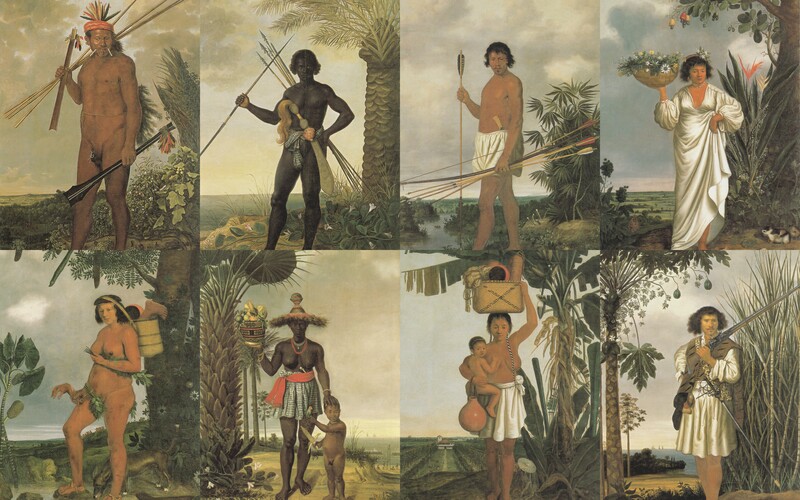 I personally like the argument that these portraits originally were intended to be displayed in Brazil, probably at governor Johan Maurits’ Vrijburg Palace in Mauritsstad (now Recife). Although there are no seventeenth-century documents to support this theory, I like the visual analysis that has been explored by Rebecca Parker Brienen to support this theory.3 In fact, this is the argument that I explored with my students earlier in the quarter. 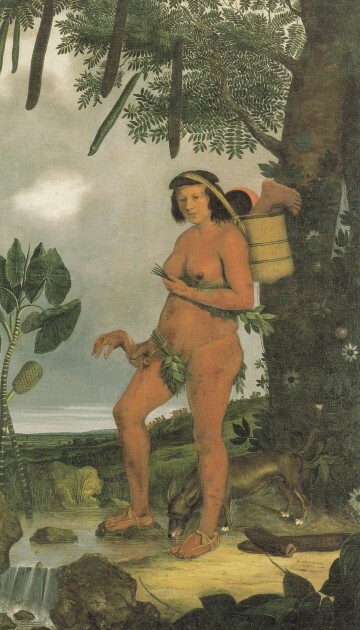 Some scholars suggest that these paintings were never created in Brazil, but were based on compositions and drawings that Eckhout had made while in Brazil. This argument is partially made because the large-scale canvases are in good condition, as opposed to the still life paintings by Eckhout which were transported in the seventeenth-century. However, it is unclear as to whether the still life paintings were damaged when they were moved from the Netherlands to Denmark (in 1654), or in an earlier transport from Brazil to Europe (p. 32). The spelling of Eckhout’s name in the series “signatures” differs from documents signed by Eckhout, which suggests that someone else added the signatures. Verified documents are signed by “Albert Eeckhout” but these paintings are signed as “Albert Æckhout” (p. 110). The questionable nature of the signature is supported because the painting of the mameluke is unfinished (see cashew fruit in lower right corner), but still bears a signature and date. Additionally, these questionable signatures explicitly state that the paintings were made in Brazil, which is unusual (p. 32). It is thought that the signatures may have been added when these paintings were presented to the Danish monarch Friedrich III (a distant cousin of Johan Maurits) in 1654 (p. 124). It is important to note that the series of paintings were not shown as an ensemble in the Mauritshuis (the European house of Johan Maurits) after Maurits returned in the Netherlands in 1644. There would not have been enough wall space for these large portraits, due to either fireplaces or rhythmic partitioning of the wall (p. 35). It has been suggested that Eckhout’s series might have been cartoons for tapestries. We know that other paintings by Eckhout were intended to be used for tapestries, including at least eight paintings that Maurits gave to Louis XIV. (p. 35-36). I think it’s good to be familiar with the other ideas that exist about this portrait series; I might cover more of these points with students when I teach this same course again. But personally, I think that Rebecca Parker Brienen still gives a pretty solid argument for why these paintings were intended to be created in Vrijburg Palace (in Brazil). At least, it’s the best (and most comprehensive) argument I have yet to see. The Buvelot text even mentions that “the uncertainty about the original purpose of the paintings makes it difficult to arrive at an in-depth interpretation, especially where the figure pieces are concerned.”5 Until more convincing in-depth interpretations and theories are presented, I’m going to have my art history students continue to explore Brienen’s argument. 2 Quentin Buvelot, ed., Albert Eckhout: A Dutch Artist in Brazil (Zwolle: Waanders Publishers, 2004), 66. 3 Rebecca Parker Brienen, Visions of Savage Paradise: Albert Eckhout, Court Painter in Colonial Dutch Brazil (Amsterdam: Amsterdam University Press, 2006), 181-199. 4 See Buvelot, 32-36. See also a specific chapter in the Buvelot text: Florike Egmond and Peter Mason, “Albert E(e)ckhout, Court Painter,” in Albert Eckhout: A Dutch Artist in Brazil (The Hague: Mauritshuis, 2004), 109–27, esp. 110. 5 Ibid., 35. This text was before the 2006 publication by Brienen, but the text does cite earlier publications by Brienen. These look VERY similar to paintings I saw in my American (US) art class. Can’t recall the artist/date from the top of my head, but I can look it up if you’re really interested. Oooh! I’d love to know the artist and date, if it isn’t too much trouble. (But if it ends up being too much of a hassle, don’t worry about it.) I discuss these paintings extensively in my Brazilian art class (and in some of the other courses that I teach, too). It would be interesting to show my students a North American counterpart. The year 2004 will mark the 400th anniversary of the birth of Count Johan Maurits van Nassau-Siegen. Together with his good friend Constantijn Huygens, Johan Maurits was one of the most remarkable figures of the Golden Age. His influence was inestimable both as the commissioner of the Mauritshuis, and as a patron and maecenas of the arts and sciences. As governor-general (1637-1644) of the Dutch colony of Brazil, he included several artists in his retinue to record the country and the local population. For example, he commissioned Albert Eckhout to produce life-sized studies of the members of the various indigenous peoples. In addition, Eckhout made still lifes of Brazilian plants, flowers and fruit. This unique series of 25 paintings hung in the Mauritshuis from 1644 to 1654. For the first time since then, the complete – recently restored – set will return to the Mauritshuis. Hi Irma! Thanks for your comment. From what I understand, the Mauritshuis is closed to visitors until the middle of 2014, due to major renovations. Juding from your comment, it sounds like the complete Eckhout set was available for viewing in 2004, but I don’t believe that it will be available for view anytime in the near future. If the set ever returns to the Mauritshuis, I would love to go and see them there.